MedHab has developed a new, patented technology in the medical device field affording medical care prescribers (Orthopedic Surgeon and/or physical therapist) the ability to customize the rehabilitation protocol to meet each patient’s needs. 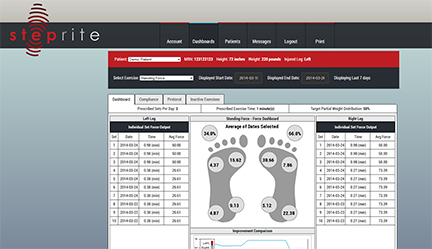 StepRite® is a wearable device that has the capability to measure body weight, pressure, gait, flexibility and thermal sensing of lower extremities using pressure sensing and accelerometer technology. StepRite® can be used pre and post surgery and will provide accurate information pertaining to rehabilitation of lower extremities. The technology behind StepRite® creates a win-win-win for the patient, medical care prescriber and insurance company, including managed care organizations Medicare, Medicaid and workers compensation. Affording medical care prescribers the ability to customize prehabilitation and rehabilitation protocols to meet each patient’s unique needs.